When it comes to toting a laptop across campus, Apple's 4.5 lb., 13 in. (2 kg, 33 cm) MacBook Pro packs a solid punch  not to mention killer looks  in its compact shell. 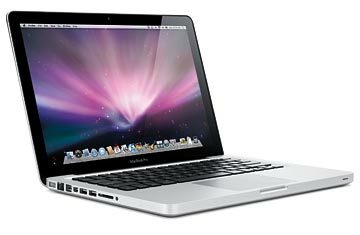 The new $1,199 model (which is pretty inexpensive for an Apple laptop) boasts a speedy 2.26 GHz Intel Core 2 Duo processor, integrated NVidia graphics for smooth video playback and gaming (not too much gaming, we hope), 2 GB of RAM and a roomy 160-GB hard drive, good for storing thousands of songs, HD movies and even the odd term paper. Best of all, this MacBook has been earning raves for its impressive battery life  north of 5½ hours, in some cases  which makes it perfect for browsing on the quad when there's nary a power socket in sight.